Documentary Now!’s much-anticipated second season will be here soon! How soon?! Tonight soon! The season debut of Fred Armisen and Bill Hader’s specificity-obsessed documentary parody series will air on IFC tonight, providing what’s certain to be an uncanny take on 1993’s The War Room. Unfortunately, we’ll have to wait until October 5 for “Final Transmission,” in which the two film/music nerds send up Jonathan Demme’s iconic 1984 Talking Heads concert film, Stop Making Sense. 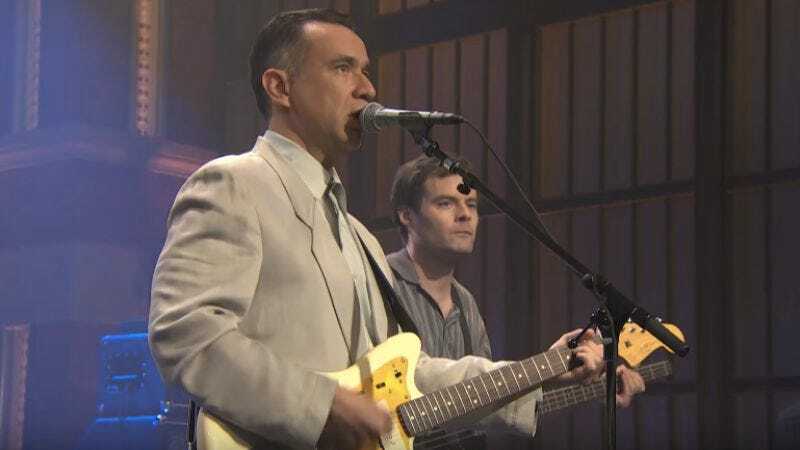 However, we did get a little taste of what we can expect in that episode when Armisen and Hader—performing as the fictional new wave band Test Pattern—showed up on Late Night With Seth Meyers to perform “Art + Student = Poor” without so much as a wink or a knowing glance at the audience. If you weren’t familiar with Documentary Now!, or these two comedians, you’d have no reason to assume that this was anything but on the level. In fact, there were probably a fair share of confused and cranky uncles out there lamenting the derivative nature of pop music today. Which, in all fairness, they probably would have been doing regardless.